F. Ambrose Clark, heir to the Singer Sewing Machine fortune, was born in 1881 and happiest on a horse. He was reported to be a “skillful and daring” amateur steeplechase rider. He played polo and served as MFH of the Meadow Brook Hounds on Long Island. After he could no longer ride due to his injuries, he was most often seen driving four in hand. At the time this photograph by Toni Frissell was published in Vogue (1953), he was best known as a breeder. His first wife was also a breeder, and maintained her own stable. 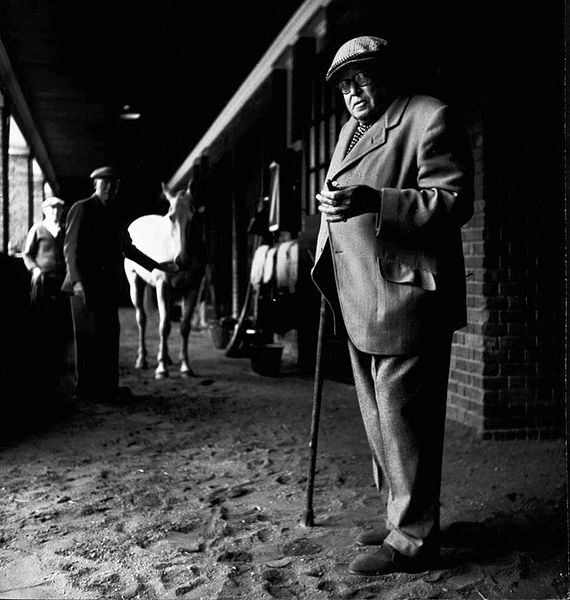 After her death, he purchased several horses in the dispersal sale. His scrapbooks are housed in the National Sporting Library in Middleburg. In this portrait, he stands in what looks like suede shoes in the dirt aisle of a stable on his farm in Old Westbury, Long Island, New York. Six hundred four acres of that estate now serve as the Old Westbury campus of the State University of New York. Dirt floors in the stable. Not so good for suede shoes. Something to gather in the cuffs of your trousers. But very good for horses’ legs. The old Westbury campus on LI serves as the home of the Smithtown Hunter Pace. Because the ground is flat and sandy, it makes for a very fast pace and was always a favorite of ours in the series. The campus is an exquisitely beautiful place to ride your horse. One run between a tree lined road will always be in my memory. I recall riding past a mansion during part of the pace.. I wonder if it was Mr. Clark’s? I bet it was. Thanks so much for sharing your memories of riding there.